Total Daily Rain started in December 2005. Last June 16, 2005 the temperature/humidity sensor has been moved from its original location and it is now enclosed in a radiation shield to avoid that direct sunlight give wrong values. Barometric lecture has been reduced to sea level in order to be coherent with other stations. The rain collector readings starded the 27th of June, 2005. Please keep this in mind when comparing values with older data. 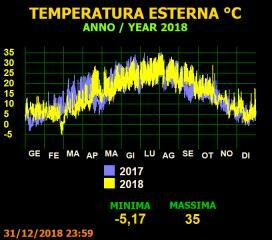 This station has joined the Centro Meteorologico Lombardo official network, Research Center for the Lombardia region area weather monitoring.